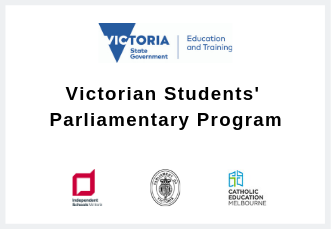 The Victorian Students’ Parliamentary Program aims to provide opportunities that support the civic learning and active participation in democratic processes of all Victorian students through local, state and national parliamentary programs and in school activities, and to support the professional learning of civics and citizenship education. Local Constitutional Conventions provide Years 9 – 12 students with the opportunity to discuss contemporary social and legal issues, and especially those relating to the Australian Constitution. The Department of Education and Training funded six local conventions. Approximately 600 students attended the local conventions each year. The Primary Schools’ Parliamentary Convention was held at the Victorian Parliament House. Approximately 100 Year 5 and 6 students attended each year. 2018 topic - Should a sugar tax be introduced to improve public health? The Secondary Schools' Parliamentary Convention was held at the Victorian Parliament House. Approximately 100 Year 9-12 students attended each year. 2018 topic - Does the Constitution meet the needs of modern Australia? 2017 topic - Should Australia abolish compulsory voting and should the voting age be lowered to 16? 2016 topic - Equal Rights – Myth or Reality?